Designed to meet NHS regulations, this sackholder is ideal for use in hospitals, doctors’ surgeries and clinics. It is pedal-operated which ensures minimum contact with the bin and prevents the spread of bacteria. The sackholder consists of two units, each with a capacity of 22.5 litres. The separate units assist in segregating different waste streams. 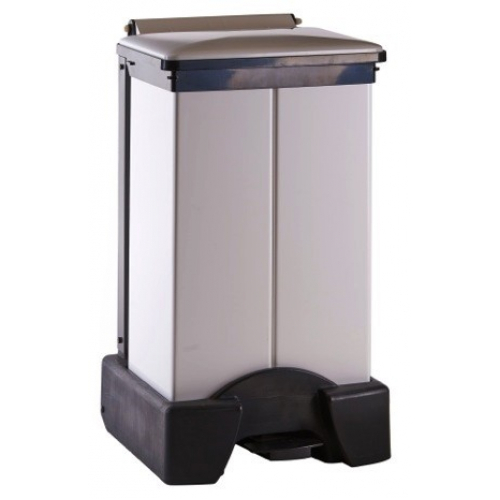 Manufactured entirely from plastic, this bin is fire-retardant, easy to clean and durable. It features two wheels and a large handle that makes ease of manoeuvring. A soft close damper comes as standard with this sackholder, making the lid close slowly and softly for quieter environments and a positive user experience. It features a plastic bag retention ring that prevents the sack from moving or falling into the bin. It is also suitable for catering and industrial use.